Indigenous olive tree pastures of Eastern Mediterranean Basin, also extending in western and southern Turkey, are unique anthropogenic habitats where grazing and olive oil production is sustained simultaneously at least for the last two thousand years. Olive trees in these areas are not planted, but they are propagated via grafting wild olive trees. Therefore, this ecosystem is extremely diverse hosting numerous Mediterranean endemic bird and plant species, including the globally threatened European turtle dove, as well as large carnivores such as the golden jackal, striped hyena and caracal. Doğa’s recent projects in Izmir, Aydın and Muğla, with the support of the Seferihisar Municipality, has shown that grazing by local goat and sheep races triggers much higher biodiversity compared to abandoned olive orchards. Because the indigenous olive tree pastures of Eastern Mediterranean Basin are rain-fed agricultural systems and they are well adapted to drought, they are at the same time a unique example for adaptation to climate change and ecosystems resilience. This is particularly important for the Eastern Mediterranean Region where freshwater is extremely scarce. Doğa is working in cooperation with the Seferihisar Nature School and Slow Food Mahal Convivium to highlight the unique olive oil of this habitat, valuable for biodiversity and people. Olive-tree pastures are key habitats for the globally threatened turtle dove and several passerines confined to the Mediterranean region. Unfortunately, every year, tens of thousands of birds are shot illegally in these habitats, as a primary threat to this landscape and its bird biodiversity. Along with documenting and promoting the unique oil of these semi-wild landscapes, through this work, Doğa is planning to reduce illegal hunting in olive-tree pastures of the Aegean. 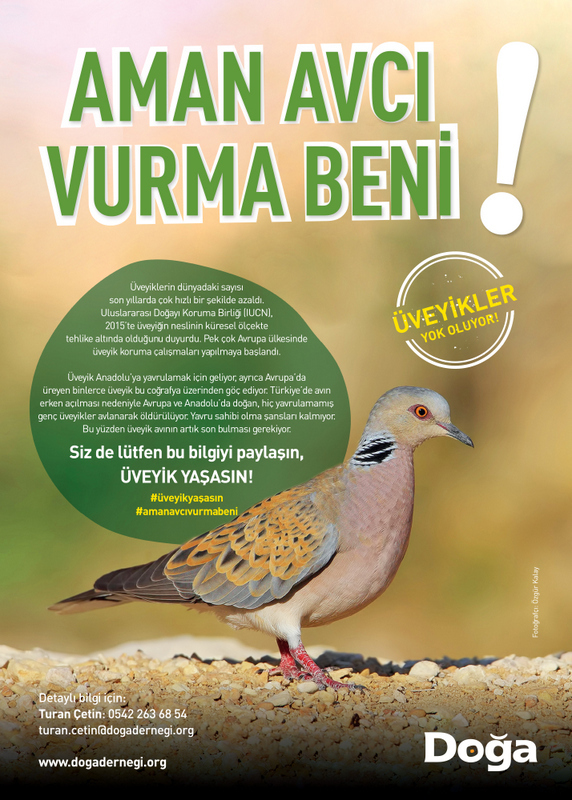 Doğa aims at preventing illegal hunting of the globally threatened turtle dove and Mediterranean passerines in the olive-tree pastures of the Aegean, through involving and supporting the local conservation groups. To this end, the research team of Doğa will map and document black spots of illegal hunting throughout the indigenous olive-tree pastures of the Aegean region in Canakkale, Aydın, İzmir and Muğla provinces. Furthermore, public awareness materials on importance of olive-tree pastures as a key habitat for bird biodiversity and the illegal hunting problem. Lastly, Doğa team will engage local communities and raise awareness against illegal hunting at black spots throughout the in indigenous olive-tree pastures zone. Local conservation groups at six black spots, working on eliminating illegal hunting in indigenous olive-tree pastures, will be supported as part of this activity.